Vision depends on more factors than those measured in a standard test for visual acuity. How person’s nervous system identifies what their eyes actually perceive is as important as the mechanical test results measured in an eye doctor’s office. Other conditions, such as emotional states, cultural influences, habituated movement patterns and education, affect how a nervous system deciphers what enters into one’s visual field. The Feldenkrais Method® helps a person sense internally how they move and interact with their environment. The Feldenkrais Method harnesses the nervous system’s capacity for neural plasticity to create linkages that aid in an individual’s learning process. It helps someone connect their unique patterns of eye movements to their mobility. In this way, participants can use the Feldenkrais Method to improve their visual health as well as their personal level of coordination. 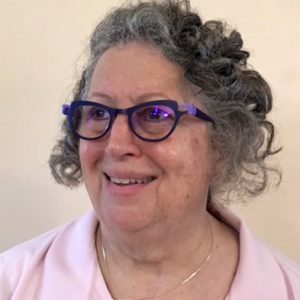 Ellen Soloway trained under Dr. Feldenkrais at Amherst and has a private practice in New Orleans. Ellen is an Assistant Trainer and the editor of the Alexander Yanai Volumes. She offers Functional Integration® lessons and mentoring in Atlanta, New Orleans, and San Antonio. Ellen’s teaching style reflects her interest in how visual cues, perceptual learning styles, and neurological developmental patterns interact with each other and affect a person’s coordination. In her experience, neurological developmental processes are a foundation for growth and change.